What is Automated Drip Marketing? Why do you need it? Marketing automation has come past being a hyped concept to becoming a mandate for every business looking to position their brand on the web. Consumers today are more conscious and well-versed about the problem statement and possible solutions. You cannot hand-over anything to your consumers these days. Every marketing effort is carefully designed to make it relevant and user-oriented. 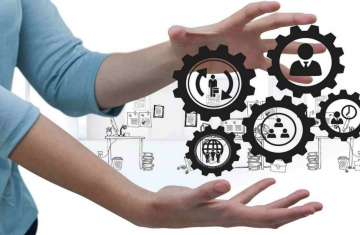 To focus on more strategizing all efforts towards their consumers’ interests, marketers are now opting for marketing automation tools that help with automated certain repetitive actions. One such core feature of automation is automated drip marketing. Automated drip marketing refers to series of marketing emails that are either scheduled or triggered by user-actions. The concept has its root in the concept of irrigation where a farmer nurtures a sapling to its full growth. Similarly, a marketer nurtures its leads to push it through the funnel and get the converted. The term ‘drip’, on the other hand, has a very straightforward meaning. Dictionary meaning states it as a verb, denoting ‘letting water fall’. In the marketing concept, the automated flow of emails, one after the other, resembles the dripping concept. The benefits of automated drip marketing are many but all of it comes with one main condition: you need to create the conditions and triggers properly to see results. To make things easier, I always suggest a simple drag and drop campaign builder like we have in Aritic PinPoint. It has zero complications and a host of conditions, actions, and decision triggers to create a perfect drip series. For instance, take a look at the drip sequence in the image below. This drip sequence is built for new signups. The first step we all know is to send a welcome email the moment a lead enters your marketing funnel. Then we have onboarding emails based on various actions the lead performs. Your automated drip marketing series can be as long as 5-6 emails or very short, say up to 3 emails. In Aritic PinPoint, you can add lead scores within your drip series. 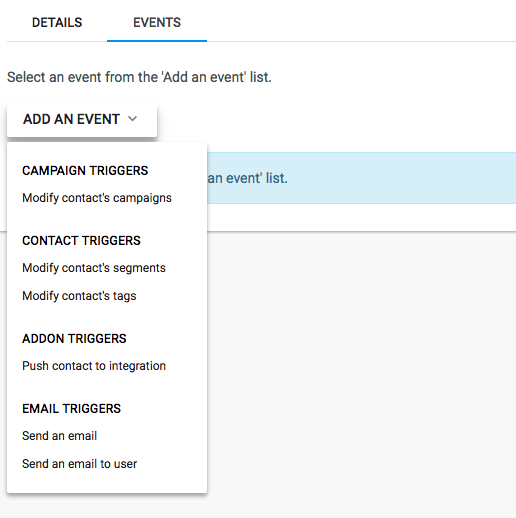 Along with that, you can create point triggers separately so that when a lead reaches a particular score (let’s say 100), it automatically triggers a follow-up action like a change of segments or sending an email, etc. This helps you in dynamically segmenting your leads based on the engagements and automatically adding them to the suitable drip sequences. 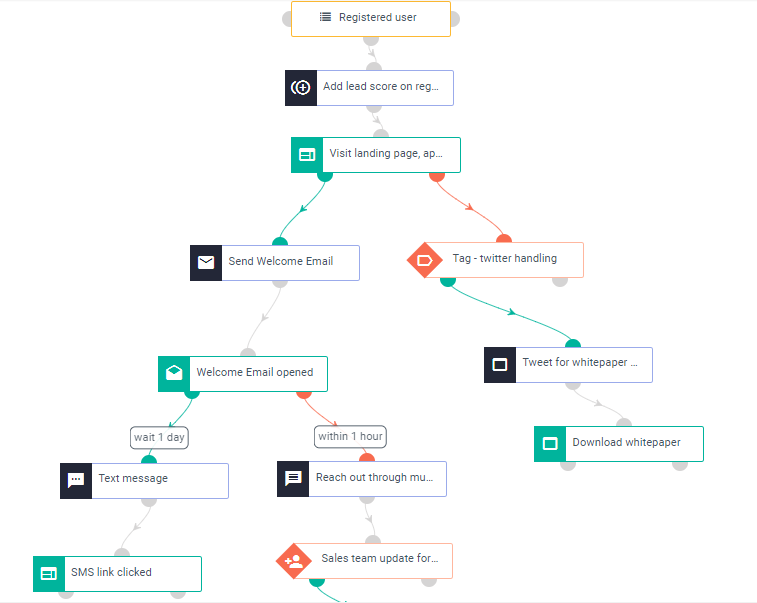 Before I tell you the various drip campaigns you can build to nurture your leads, here is an overview on why automated drip campaigns work for brands. In my previous article on capturing leads with drip campaigns, I had mentioned the benefits of using drip campaigns. Here’s a quick summary for you. Automated drip marketing saves time and is quite effective. It not just boosts your user engagement but also speeds up the conversion rate. Isn’t that what we all want?! Here are few ways how automated drip marketing is beneficial. Not all leads engage equally. Some might subscribe and remain inactive, while others may be very active. Instead of letting go those leads that have subscribed but are not engaging, you can bucket them into a separate list and conduct drip campaigns to make them ‘warm’ (Yeah, that’s the term we use to denote potential leads). Automated Drip marketing can help you to re-engage these leads. 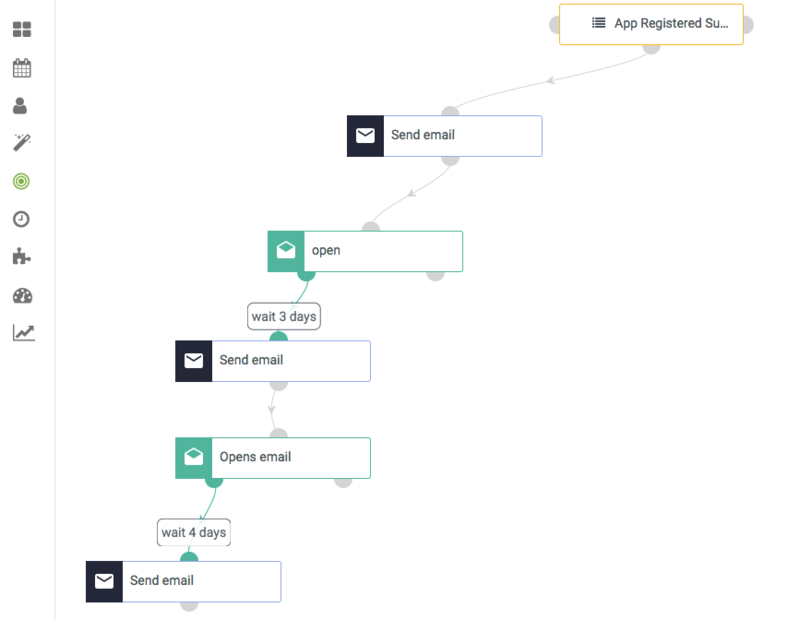 You can schedule and design the entire workflow of your drip marketing. Automated drip marketing is a one-click matter. Once you have set the behavioural triggers and/or set the schedule, you are done. For instance, the 10-step drip email campaign from LearnPad to educate their users to urge them to use their technology. That was one great way to do automated drip marketing campaigns. Personalization is crucial in targeted marketing. With an automation tool, you can segment your users in different lists based on their demographics, website behaviour, email engagement, and many such factors. Once you have segmented your lists, you can now automate personalized drip campaigns with relevant content and context. Drip emails are beneficial for the sales team as well. Since automated drip marketing is about sending the right information at the right time, it helps in pushing leads through the marketing-sales funnel faster. Now we know how marketing-sales work together to get better conversions, right? With automated drip campaigns, marketing team educates the leads about the industry, product, and other related concepts. When they start exhibiting buying symptoms, the sales team takes over. (PS: With all the resources and information about the buyer’s persona, drip campaign details, and product details, the sales team can quickly convert the leads). I had already mentioned that drip campaigns can be of various types- welcome campaigns, onboarding emails, lead nurturing, educational, renewal or confirmation emails, re-engagement emails or event-based/updates. So, without much ado, let’s start with automated drip marketing campaigns that can cause higher lead engagement. When you sign up or subscribe to receive product updates, the first email that you receive is a ‘Welcome Email’ which is personalized with your first name, a welcome message and few immediate things you can do to start off with the product/services. It is sent under the name of either a marketing person or directly the CEO/founder (i.e. a genuine person involved in making your experience with the brand better from the start). Another example of an automated drip marketing welcome series is that from Lifecycle Marketing. Okay, a disclaimer. I love dogs. 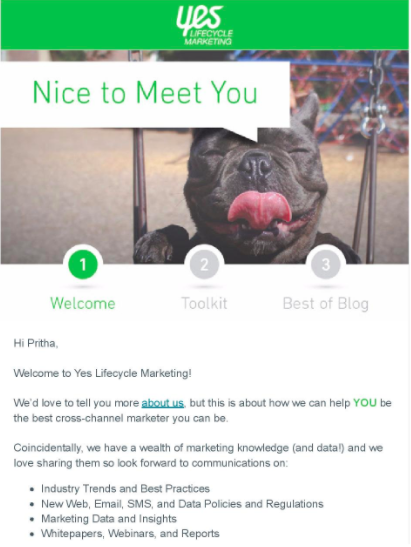 So, obviously, I loved this welcome email from Yes Lifecycle Marketing, an email and cross-channel marketing solution. There are other reasons as well to list this welcome email here. The bold green colour gives an image of nourishment, which is the core of their brand proposition. The content is easy to understand and connect with. Instead of talking about their brand, Yes Lifecycle Marketing quickly turns the focus on their new prospect. To help with getting started, they enlist few areas that come under their forte. 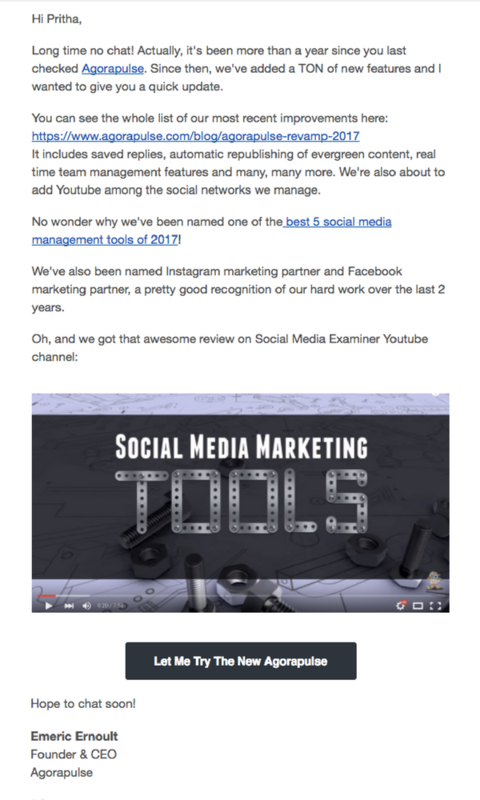 The email continues with few popular resources that can help and motivate a marketer like me to click. Lastly, the personalized signature and name of the V.P. of Marketing, does the job of establishing a one-to-one eIntroduction. Welcome emails are closely followed by onboarding emails. Onboarding emails can be a series of email, like the 10-step onboarding email from LearnPad, or few pre-scheduled emails to help your new prospect get acquainted with your brand and all the resources. It usually has small milestones for prospects to complete rather than getting lost trying to figure out what to do next after having signed up. Often onboarding emails are also sent based on the lead behaviour. For instance, if a lead is stuck somewhere on your website, based on the details you can send an onboarding email to get going from that point. It is another way of pushing your leads down the marketing funnel but with utmost care. Few other types of onboarding emails include milestone emails, task complete/almost done emails, inspiration emails, and win-backs. Here’s an example from Dropbox, a cloud storage service. 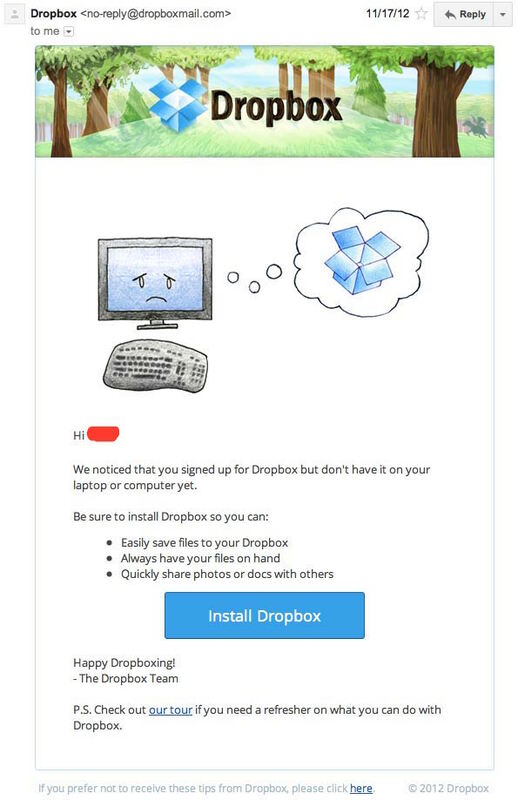 Dropbox promptly urges its users to install Dropbox on their laptops or desktops. It encourages users to experience the entire ecosystem of Dropbox’s cloud storage service. The graphic and simple content does the trick for Dropbox. It quickly highlights the benefits of using the entire Dropbox ecosystem. Least to say, the UI of this email is by far the most engaging, intuitive and motivating. Buyers go through various stages before finally hitting the ‘buy’ button. And in every stage, they require ample resources and information to know your brand, know about the industry, the various problem statements, and their plausible solutions. When they have gained the requisite amount of information to proceed to the final stage of their buying cycle, that’s when you give them resources to understand how your product/services are the best options for them. To push your prospects smoothly through the funnel, brands opt for educational and awareness drip campaigns. These campaigns are directed towards sharing information and resources with prospects so that they can take the right decision. While you don’t explicitly start marketing your product or brand from day 1, all your efforts are directed towards that direction. Educational or awareness marketing campaigns are a continuous loop. Based on lead behaviour and/or as per pre-decided schedules, these emails are sent. However, these emails are also highly targeted and personalized. You don’t send the same email to all your subscribers. Based on your advanced list segmentation, emails are designed and sent out. 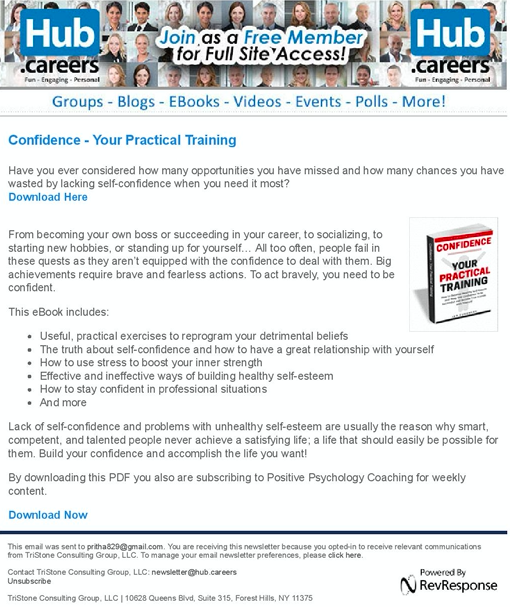 For instance, this email from Hub.careers that offers an eBook that is related to my domain and interest. This eBook stirs up certain emotions with its opening lines. We all have been there where we missed out on opportunities because we lacked self-confidence. The most obvious answer in most cases will be a yes. And that’s what will trigger you to go for the download option. It clearly states the purpose, content material and how you will benefit from this resource. Targeted and relevant campaigns play a pivotal role in boosting your overall marketing ROI. Seriously, I swear. Alerts or reminders always cause user engagement. A reminder to renew your account or a confirmation email or transaction confirmation details – emails like these hold a very important place. We often call these as Transactional Emails. These emails are slightly different from general marketing messages. When you make a payment, you eagerly wait for the confirmation email. Least you fail to receive the confirmation, you need to ring the emergency bell and call upon the support team. These emails are entirely action-oriented and automated. On the other hand, marketing messages are mostly pre-planned and scheduled. The email is clean and has all the information I require to believe that my payment didn’t go for a toss. Had I not received this email, I would have panicked more than I could imagine! I know you would too if something like this happens with you (Fingers-crossed). It rarely happens that we look for events and webinars like a daily routine. That’s not a search we’d do every day, and brands know that. Even if you have attended the first two or three webinars of a single series, you’d hardly keep a tab on when the next one is due. Hence, based on proper segmentation of email lists, brands send out event or webinar invitations, reminders, and alerts to its users. They make sure you don’t miss out on any of their events or webinars or a talk show that might benefit you. 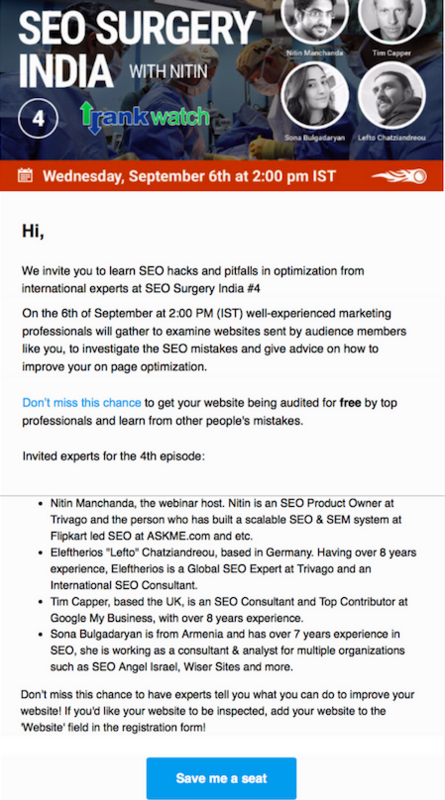 For instance, this event reminder from SEMRush. This email has all the details about the entire event. It lists down all the experts who will be part of this event. After all, you always want to learn from experts only. That’s a human psychology! The bonus in this email is the free auditing of your website. Now, that’s something a marketer like me will be quite interested. A free SEO audit will mean that I can know the loopholes in my website and where exactly I need to work on, from a professional. I showed this email to my friend who is a technical person and also starting her own eCosmetics website. She also got pretty perked up with the ‘free auditing’ thing. Emails like these not just remind you that an auditing for the website is pending, but also gives you a strong reason to be a part of this event. Lastly, the CTA triggers a personalized connection where all you need to do is just click on the bold blue button and save a seat quickly. It manages to impart a sense of urgency, which is quite the purpose of this email. Promotional drips are another weapon for marketers, but with a twist. Most often, users will segregate their inboxes into various tabs like Primary, offers and promos, social, etc. based on their interests. Many see these emails as annoying. So the key for your promo email to work in your favour is to be highly relevant. You cannot send a sign-up discount to someone who just upgraded their plan one day back. The starting point for any automated drip marketing is to start with contact list segmentation; promotional emails are no different. If you can provide a valuable offer that can be beneficial to your users, your promo email can be a winner. Sometimes, I find many brands sending me promotional emails that loudly say how it will benefit them. And that is a turn-off for any user. 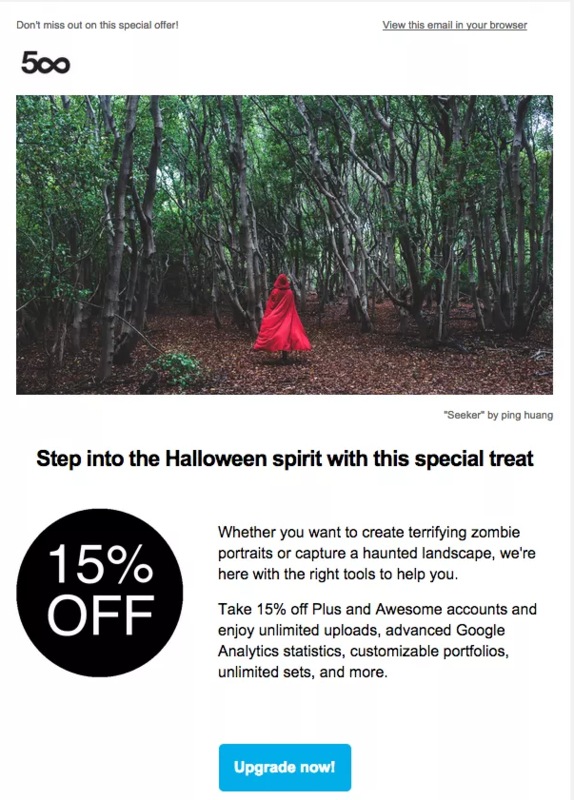 Take a look at this promotional email from 500px. 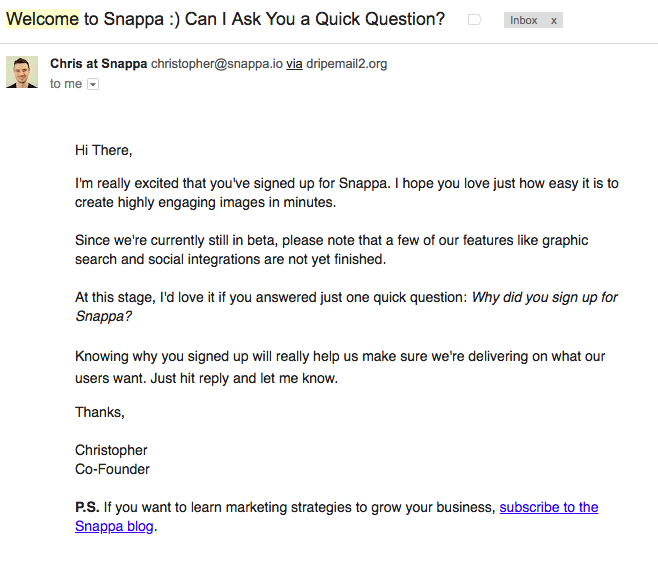 This email is crafted in a way that instantly helps its users establish a connection. Users of 500px are already familiar with ‘Plus’ and ‘Awesome’ accounts. They very frequently use these terms. Users will immediately know what this email is about without having to read the entire text. Add to that, the bold discount offer and a contrasted CTA does the work for 500px. It is clear, nicely designed and to-the-point. Surely a winner. When a user leaves without buying despite having reached the final stage or cancels a paid subscription, a brand will do everything to stop the user from abandoning. In marketing terminologies, we call it ‘cart abandonment’. Although it fits perfectly for an eCommerce brand where a user adds items to the cart but leaves without making a purchase, we like to use the same concept for every other brand. Cart abandonment drip campaigns are behaviour-based drips that get triggered when a user clicks on the ‘cancel’ button or symbol, attempts to go back to the homepage, or cancel a subscription and confirm the same. Like Netflix did when I confirmed my subscription cancellation request. While my account got canceled immediately, I received this email almost in a snap. 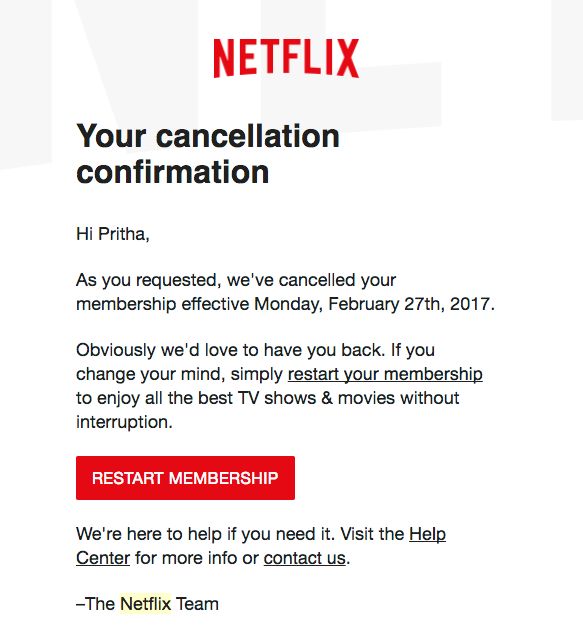 Here Netflix confirms my cancellation and also simultaneously tries to get me back on board. How? By mentioning exactly what I will miss without my Netflix subscription. The CTA clearly states that restarting my membership is just a click-away. Re-Engagement Drip Marketing is another way to reconnect with users who were once active on your website or blog. Like I mentioned earlier, not all users will engage in the similar fashion. While some are very active from day 1, there are many who are active initially but stop engaging with time. These are your target leads for your re-engagement campaigns. You might ask why only these? Because these leads were once interested in your brand. May be with time, you failed to give what they were looking for, or they had an issue that had remained unresolved, or something else. With a re-engagement campaign, you take another attempt to restore the lost contact with more relevant content and exclusive offer. Most often, we also call it a ‘winning back’ campaign. Here’s an email from AgoraPulse that will give you a better idea about re-engagement drips. It is no secret that marketing-sales alignment is crucial for any business to grow. Without the two operating together harmoniously, it is next to impossible to provide users with a consistent experience. If the marketing team and sales team are operating on different ideologies, the end result will be a massacre and poor customer service. A marketing team needs to know exactly what kind of buyer’s person the sales team is looking for. It is vital they know the sales positioning of the brand. Only then can they direct their marketing activities to a more targeted user base. Similarly, sales rep must know the background of each buyer, the various promotional and other marketing activities, and have a clear idea about the brand image. In short, both the teams have to be in sync which a marketing automation tool offers. Now that both the teams are in sync, often sales team will require marketing team to send out sales emails on their behalf. They require the marketing team to streamline their sales email templates and schedule the same- either set behaviourial triggers or schedule them two or three days apart. In fact, it was hands-down our best-performing sales prospecting email ever. Here are the statistics from their campaign and their full story here. This automated drip marketing campaign is somewhat similar to the cart abandonment campaign. It is triggered by the user-behaviour who clicks on the unsubscribe button. 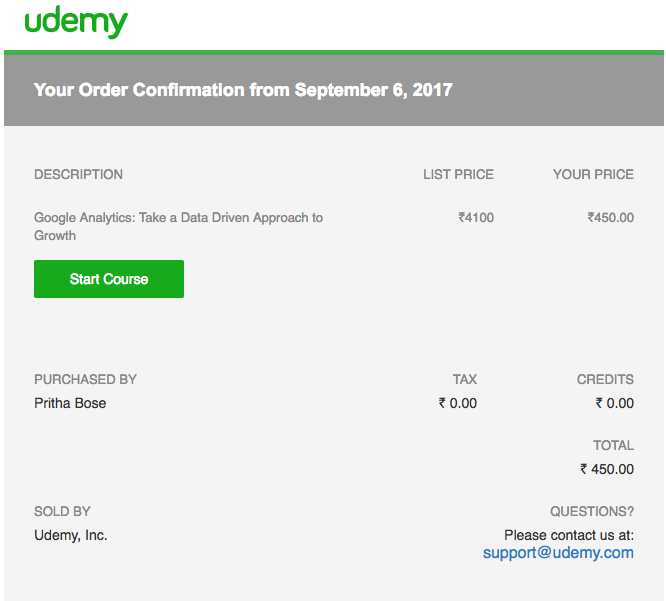 Often I have seen my fellow marketers asking what is the need for an unsubscription drip campaign? To answer this, it is important to understand this first- Unsubscription happens not only because your users hate your brand. It can also be because they are looking for some other channels to get connected with you. 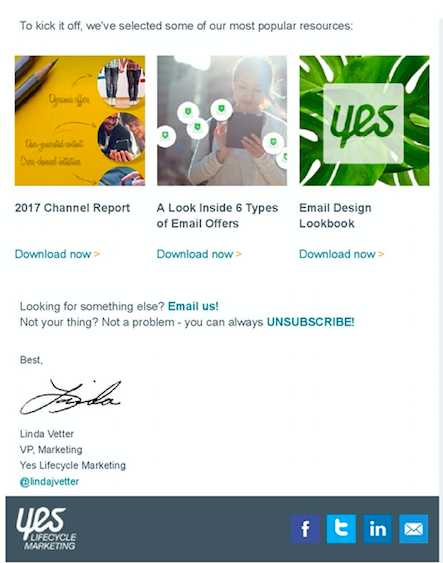 There can be a variety of reasons why your users choose to unsubscribe from your marketing list. So, never miss out on the chance to get them back on board. When you are sending you the automated drip email after they have requested for subscription cancellation, add a little “we’re sorry to see you go” kind of message. It helps in making that last attempt to get them to join back your marketing list, or end the note on good terms. Or, you can add a little humor as well, as Groupon did. When you unsubscribe from Groupon’s daily email list, this is what happens to Derick “who thought you’d enjoy receiving daily emails from Groupon.” Honestly, this one is just great. Is there any other type of automated drip marketing campaigns? When we talk about drip campaigns and examples, we automatically refer to various email drips. Its because email campaigns are the most effective ones and probably the most frequently used mode of marketing. But that doesn’t mean you can only create email drip campaigns. This brings us to the end of this list. These are 9 automated drip marketing campaigns that can help you increase your lead engagement. If you have tried any of these or any other marketing campaign that gave you results, let me know in the comments below. A bonus read: We recently published a compilation of marketing resources for high converting email campaigns. I think you’ll love it. It’s great that you have written about push notifications, you can improve the engagement rates. Hi Pritha, You’ve written a very nice article here. Your article will surely help marketers and small business owners like me to understand drip marketing strategy. Thanks a lot, Pritha! It’s a great comprehensive content on drip campaign management which can help me to manage multiple channels for my business. It was an interesting blog about the drip marketing campaigns. Thanks a lot for updating it Pritha! I am so glad that I came across this article, Pritha, thanks for sharing. Because the concept of drip into push notifications, you can improve the engagement rates. Of course, Drip campaign management helps you to combine great triggered emails with well-structured and targeted marketing campaigns and multiple channels for your business. Email is the third most influential source of information for B2B audiences, behind only colleague recommendations and industry-specific thought leaders. 86% of business professionals prefer to use email when communicating for business purposes, so naturally, email campaigns will grab the eye of important leads. Email newsletters are a great way to send out our team’s latest announcements. However, I think Drip campaigns aren’t limited to email—the term also applies to direct mail and phone-based marketing, too. 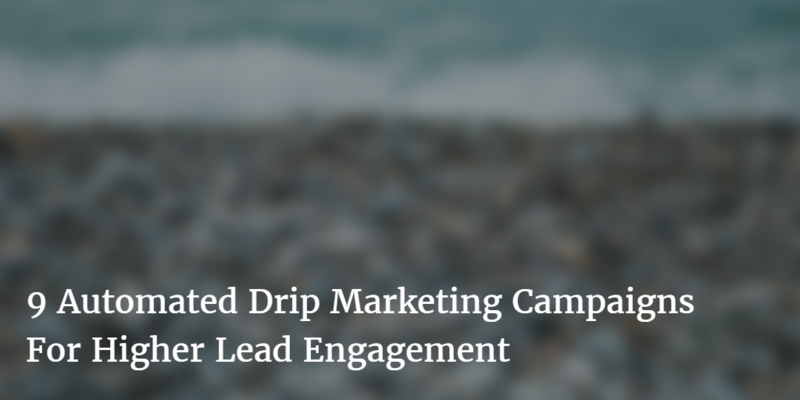 I completely agree with your point that leads can be better engaged with Drip Email Campaigns. Also, according to a research by Epsilon, the open rates for drip campaigns were 61.7% higher than that of usual email campaigns. It is evident that we can engage our prospects much better and more efficiently with Automated Drip Email Campaigns. Each lead is unique so is their opinions, preferences, likes and dislikes. Automated Drip Marketing engages leads in a highly-personalized manner based on their interests and finally pushes them down the conversion path. Loved your post! There is a reason why these campaigns are so popular, yes in marketing, timing is the key. And these automated drip campaigns should land right where they’re supposed to go, over time, with a minimal wastage else we would lose a chance in converting our lead into a customer. Really thorough post! I will make sure to use these tips before sending mails. Thanks!